Sir Edward Villiers was an English politician and military officer from the powerful Villiers family. Twickenham is an affluent suburban area of west London, England. It lies on the River Thames and is 10 miles (16 km) west-southwest of Charing Cross. Historically part of Middlesex, it has formed part of the London Borough of Richmond upon Thames since 1965. Frances Apsley, later Lady Bathurst, was a maid of honour to Mary and Anne of York. Letters written to her by a sentimental adolescent Mary reveal that Mary idolised Apsley. 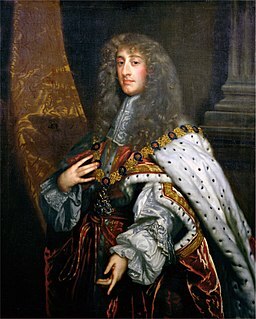 Whilst there are some historians who believe the writings to be proof of Mary's homosexuality, most historians disagree for after Mary's marriage to William of Orange she fell deeply in love with her husband. She did, however, maintain her platonic friendship with Frances, who married Sir Benjamin Bathurst, via ongoing correspondence. 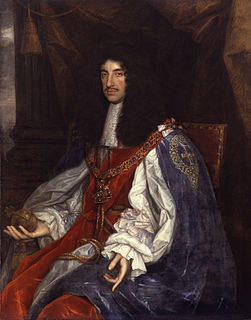 Sir Allen Apsley (1616–1685) was a leading Royalist in the English Civil War. 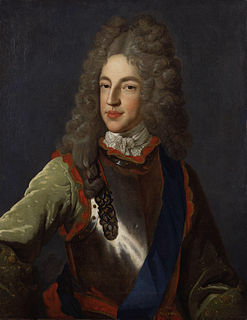 He was the son of Sir Allen Apsley (1582–1630), and brother of Lucy Hutchinson (1620–1681). Henry Compton was the Bishop of London from 1675 to 1713. 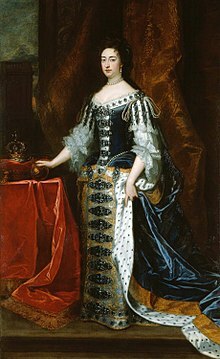 ↑ Mary II was declared Queen by the Parliament of England on 13 February 1689 and by the Parliament of Scotland on 11 April 1689. 1 2 "Mary II". Encyclopædia Britannica. XVII (11th ed.). New York: Encyclopædia Britannica, Inc. 1911. p. 816. 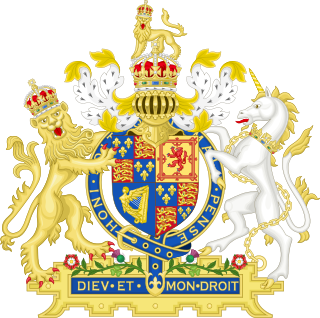 ↑ "The House of Stuart: William III and Mary II". English Monarchs. 2004. Retrieved 18 September 2006. 1 2 3 4 5 "King James' Parliament: The succession of William and Mary". The History and Proceedings of the House of Commons: volume 2. British History Online. 1742. pp. 255–77. Retrieved 19 September 2006. 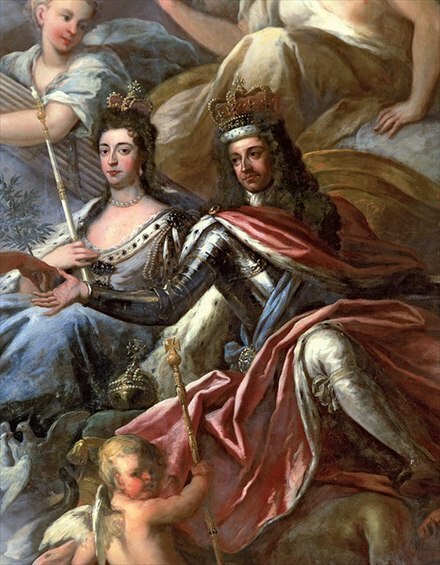 1 2 "William III and Mary II". The Royal Household. Retrieved 18 September 2006. ↑ "William Sancroft". Encyclopædia Britannica. Encyclopædia Britannica Online. 2006. Retrieved 21 September 2006. ↑ "John Graham of Claverhouse, 1st viscount of Dundee". Encyclopædia Britannica. Encyclopædia Britannica Online. 2006. Retrieved 21 September 2006. ↑ "The Contemplator's Short History of "Bonnie Dundee" John Graham, Earl of Claverhouse, Viscount of Dundee" . Retrieved 20 September 2006. 1 2 "Bill of Rights". 1689. Retrieved 19 September 2006. ↑ See also the Absence of King William Act 1689. ↑ "Music for Queen Mary". The Public Library of Cincinnati and Hamilton County. Retrieved 18 September 2006. ↑ "No. 1249". The London Gazette . 5 November 1677. p. 1. ↑ Brewer, E. Cobham (1898). Dictionary of Phrase and Fable. Philadelphia: Henry Altemus Company. p. 891. 1 2 Louda, Jiří; Maclagan, Michael (1999) . Lines of Succession: Heraldry of the Royal Families of Europe (2nd ed.). London: Little, Brown. p. 27. ISBN 978-0-316-84820-6. 1 2 Louda & Maclagan, p. 50. 1 2 3 4 Louda & Maclagan, p. 140. 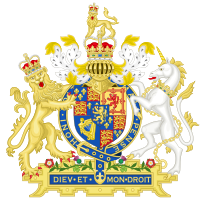 Wikimedia Commons has media related to Mary II of England . "Mary II." . New International Encyclopedia . 1905.